Phase 3 of the Marvel Cinematic Universe is in full swing, with Captain America: Civil War closing in on $1 billion worldwide at the box office, after just a few weeks in theaters. While the studio has this phase set in stone, many are wondering what they have up their sleeve for Phase 4, with the studio setting three dates in 2020 for unspecified movies. Marvel Studios president Kevin Feige recently teased that they're is committed to making a stand alone Black Widow movie as part of Phase 4, and it seems that one of the MCU's other heroes wants to be a part of this story as well. During an interview with Hitfix, Anthony Mackie revealed that he would like his character The Falcon to be involved in a potential Black Widow movie. 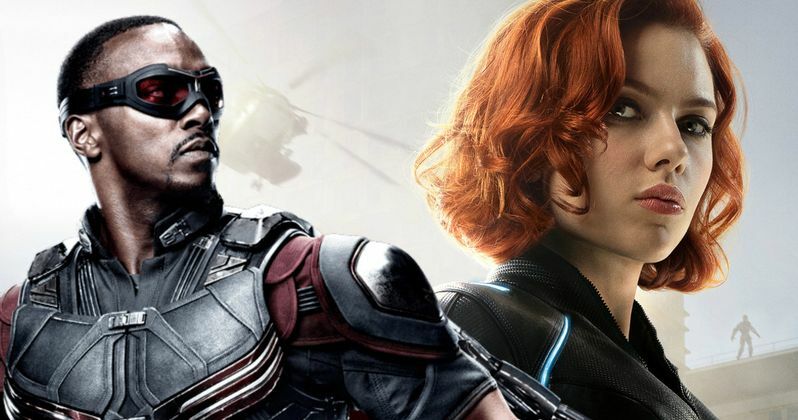 Of course, both Black Widow and The Falcon were on opposite sides of one another in Captain America: Civil War, but that doesn't mean he won't lend her a hand in a solo movie. Here's what Anthony Mackie had to say, revealing he would like to see more of an "espionage-type" thriller for the standalone Black Widow. "If they made a Black Widow movie, it would be more of a spy espionage-type movie, which would be great, to see a female James Bond or something like that. Well, I think Black Widow needs a little bit of aerial support! I would love, in any capacity, to be a part of that. I've always been a huge fan of Scarlett's, and I've always, since I met her, just really admired her as a person. So in whatever capacity I would be used - Falcon would fly for Black Widow." Earlier this month, a poll was conducted with 1,000 moviegoers who already had purchased tickets to see Marvel's Civil War. These fans were asked which of the current Avengers should get their own standalone movie, and the overwhelming winner was Black Widow, who grabbed 48% of the vote, easily beating out Paul Bettany's Vision (15%) and Anthony Mackie's Falcon (12%). As for The Falcon, it hasn't been confirmed what movie he'll pop up in next. Here's what he had to say, when asked if he knows whether or not The Falcon will surface in the upcoming Black Panther movie, set for release on February 16, 2018. "I don't (know). Marvel is so interesting. They don't tell us anything. They basically give you little tidbits every now and then." MCU Phase 3 will continue later this year with Doctor Strange, hitting theaters on November 4. That mystical adventure will be followed up by Guardians of the Galaxy Vol. 2 (May 5, 2017), Spider-Man: Homecoming (July 7, 2017), Thor: Ragnarok (November 3, 2017), Black Panther (February 16, 2018), Avengers: Infinity War Part I (May 4, 2018), Ant-Man and the Wasp (July 6, 2018), Captain Marvel (March 8, 2019) and Avengers: Infinity War Part II (May 3, 2019). Be sure to stay tuned for more updates on the potential Black Widow movie and the rest of Marvel's expansive Cinematic Universe. Black Widow Recruiting The Favourite Star Rachel Weisz?